Today’s guest post and feature photo are by David Arment of armentphoto.com. I’ve always suspected that the reason this stretch of rail was called “Pumpkinvine” was because the tracks meandered across the countryside like a pumpkin vine, in other words in less than a straight line. 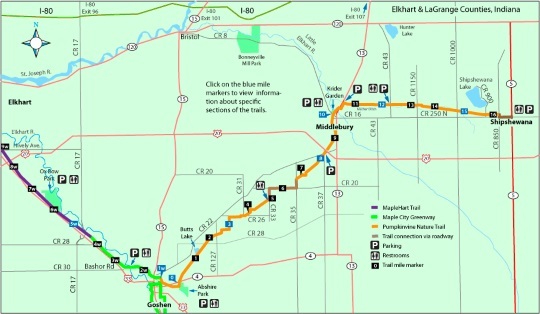 If you ride the trail from Shipshewana to Middlebury you will see the trail is not a “straight shot”. To “the English” the Pumpkinvine is a wonderful liner park used for walks and bicycle rides in the spring, summer and fall. To the Amish it is more. It is an alternative road. A road without motorized traffic. Horses are not allowed on the trail, but many Amish use it and bicycle to work and to Shipshewana to shop, or to enjoy the free concerts on Friday night downtown or for other similar events. The Shipshewana “city fathers” considered trying to keep the trail clear in the winter to help those who needed it to get to town. As with most things, the subject of money was an issue and who was going to pay to keep the trail open… and so the idea died. Now everyone must use County Road 250, otherwise known as the Middlebury Shipshewana road, to get to Shipshewana in the winter. I don’t know if the idea of keeping the trail open in winter was ever discussed in Middlebury. 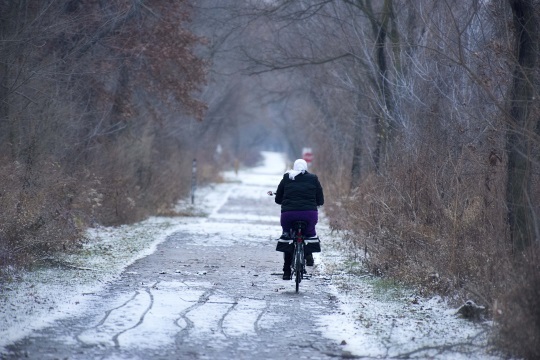 As winter gets more intense the use of bicycles wanes, but there always seem to be a few Amish who venture out into the cold and snow with their bicycles, no matter the cold or intensity of the wind. I sometimes wonder if they do (or should) make snow tires for bicycles. Below is a picture taken November 28, 2014 of an Amish lady near dusk riding away from town on the Pumpkinvine. As you can see we had some snow on the ground. The sun heated the black tar during the day but as the sun set the water on the trail turned to ice and walking or riding a bicycle was “iffy”. See more of David Arment’s photos at the Arment Gallery & Gifts Facebook page. Yes,there are snow tires on the Internet but not much help to the Amish if stores in their area do not carry them. My wife knows the local Amish bicycle shop as she has had them put a carrier on her bicycle (just like the Amish have). So I’ll have her ask if they have snow tires. It’s just a point of curiosity. Well I finally made it out here and when I walk out my back door I am about 75 feet away from the trail and Krider garden is a hop skip and a jump away I can’t wait for spring so I can explore more of it, from the brochures I’ve read and the pictures I have seen it’s a sight to see. I live in Middlebury and our family frequents the Pumpkinvine Trail. This trail has become sort of an Amish transportation link. Thanks, David Arment, for the post! It would be nice if “city fathers (or “mothers”, if there are any 😉 ) would help maintain the trail year ’round. It certainly seems like a much more scenic route, and is obviously of use to Amish “bikers”. No doubt, English bikers would also use it. We have a number of “re-purposed” former railroad beds in my county, changed into bike & walking paths. They’re very popular—if snow blows over the trail, people break out snowshoes & cross-country skis. i’m not sure how much they’re “maintained” in winter, but it doesn’t keep people from using them! Melissa, that’s interesting about the zip tie snow tires for bikes. I just saw a photo last week from a library with a “maker space” that was decorated with a garland made of thousands of zip ties. Who knew how many creative (and useful) things you could make with lowly zip ties! I’ll bet the scenery on this trail is beautiful in spring/summer/fall. I have seen bicycle tires with metal studs in them for snow and ice riding. I read often but dont post much. About 8 miles from us, just over the VT line in NY, a group of Byler amish have been moving in. They are coming from Fort plain, about 22 families, buying up abundant neglected farmland. They have been very busy this summer, 6 barns, 8 silos, 2 schools and many houses. Most seem to be dairying. I would like to take some pictures, put together a Post for you. how is this done by readers? Send you an email with pics attached? Thanks! Enjoy reading this blog! Hi Adam, just email me at ewesner@gmail.com . Thanks. I was born and grew up on a farm near Middlebury. The Pumpkin Vine either bordered to Grandpa’s, (and then Dad’s farm) or ran across it. I can not remember for sure as it was over 50 years ago. I was six when we moved off of that farm but it is still in the hands of family today. It would seem to be that when I was a kid we would see the train run there once in a while; now of course it is a hiking and biking trail. I wonder if anyone has history of when the train would last have run there to see if I remember correctly. From 1964 to 1978, 14 years, I grew up on a farm 1 mile east of Middlebury, on 250, the Shipshe-Middlebury road. The Pumpkinvine Railroad bordered the back end of our farm, and I clearly remember the train running through there, whistle blowing and smoke rolling ! 🙂 But I don’t recall when it quit running…. The farm is still in my family as well…. Still has the aura of “Home Sweet Home” ! LOVE the Pumpkinvine Trail. If you start in Middlebury and walk/bicycle TOWARD Shipshe, you’ll pass an Amish schoolhouse and a farmer who raises camels. Great area to visit!